Read the headlines these days, and its all roses and growth and progress in MLS. The league will talk you ear off about the explosion in attendance figures and fan culture in the Pacific Northwest and Canada. You’ll hear about how the successful sides such as LA, Sporting KC and Philadelphia have contributed to their continued positive attendance figures. where are you going to be on 6/1/2013? But those kinds of positives often mask the negatives. Sure, we’ve all heard about the much publicized dwindling numbers at Chivas USA and DC United. But there are also struggles in Chicago, New England and even in my own backyard in Columbus. And though each club features a passionate group of core supporters, they’ve struggled to pull in regular season ticket holders and regularly fill their stadiums. So while finding a way to improve those numbers is not only crucial to the league, but also crucial to ensuring the long-term future of franchises such as Chivas USA and Columbus. With the demand for an MLS franchise at seemingly an all time high — and the league needing FIFA’s blessing to expand beyond the now 20 clubs that will feature starting in 2015 — the likelihood of a club being uprooted and moved to a new market grows with each empty seat. Rest assured, efforts are being made to help prevent that from happening. For their part, the Crew front office launched “Goal 10K” in September 2011 to increase season ticket sales to 10,000. Don Garber’s recent visit to Columbus brought with it news that the club expects to eclipse the 7,000 mark this season (up 45%) and year-over-year ticket sales also being up 15%. All good news, but not quite the swift growth the club had hoped for. So couple that with poor turnouts in the Crew’s opening home matches this season, what else can be done to help Crew attendance figures to continue to climb? if Operation June 1st Sellout have their way, this is what that stadium will look like shortly after kickoff. Following in the “proactive fan” footsteps of the Free Beer Movement, a supporter-lead movement has sprung up to help the club in their efforts to attract more fans. Matt Goshert, host and co-founder of the Massive Report podcast, and Chris LaMacchia, a writer at the same site, launched the “Operation June 1st Sellout” movement on May 14th. The aim? To pack as many fans as possible into Crew Stadium for the next home match against the Houston Dynamo. But why? “We want to get a bunch of people and bring them out for either the first time this season or the first time ever,” LaMacchia said. Goshert added, “The Crew’s attendance seems to usually pick up mid-summer and we were hoping as fans we could move that needle sooner and show the city of Columbus a good time in the process.” And though they aren’t necessarily expecting an actual sellout on the first of the month, they do think they can positively impact the atmosphere in stadium that day. And just to be clear, it’s also more than just an effort to further pack the Nordecke, the supporters section at the North end of the stadium. Families in the cheap seats, college students before the head out of town for the summer, and the casual fan that maybe only makes it out once a year… they want you all. And given the low cost of entry for just about every seat in the stadium — the most expensive ticket on sale that day is jut $55– it’s a goal that isn’t out of the realm of possibility. 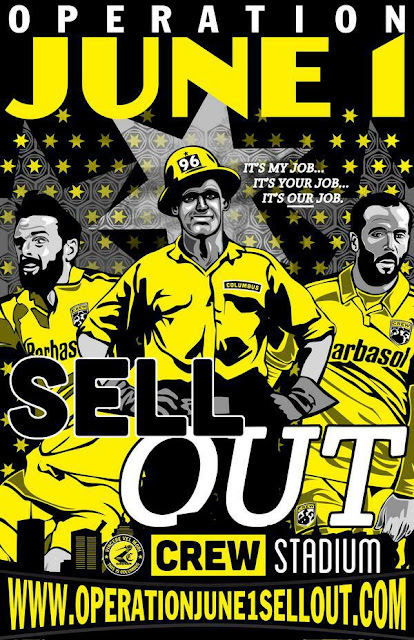 So tell your friend, tell your neighbor, tell the guy sitting next to you at every traffic light your stopped at between now in June 1st: Come out to Crew Stadium at 7:30pm on June 1st and find out what MLS and the Crew have to offer. And not only that, but tell them that they need to come to show the league and the country that Columbus is a place they’ll want to be for years to come. the guys from Operation June 1st Sellout will be giving away one of my shirts! Now unfortunately, I won’t be able to join in all of the fun on June. Despite making it out to the season’s freezing home opener, I’ll be in the middle of a hectic week of footy-related travel (I’ll be in Cleveland on May 29th for the US-Belgium game, and then working on a project in Chicago centering on the Fire’s match against DC United three days later) and won’t be able to squeeze Columbus into the itinerary. 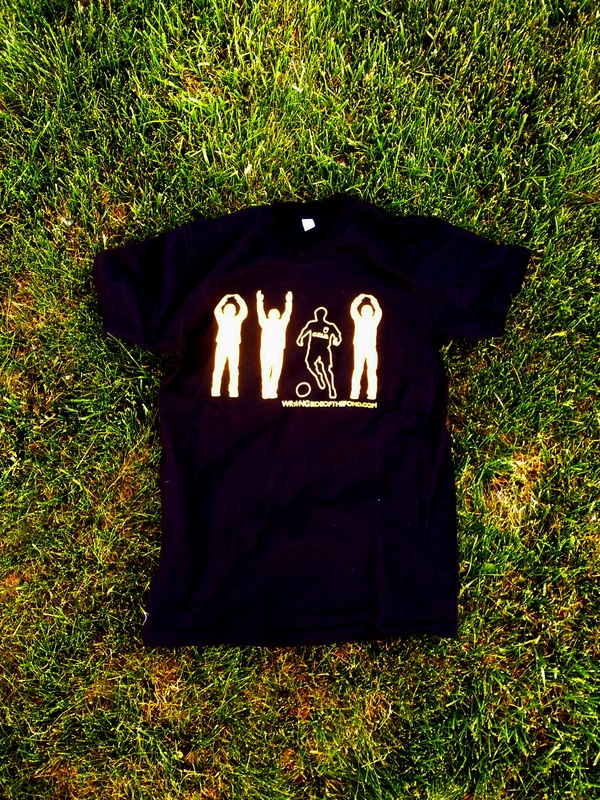 So to help do my part to put some butts in seats on June 1st, I’ve partnered with Operation June 1st Sellout to give one lucky participant one my new “My Team is from O-H-I-O” shirts from the WSOTP Shop! So how do you win it? One person who tweets or re-tweets the hashtag #OperationJune1Sellout will win a free access code for MLS Live. Multiple tweets = multiple entries. You may enter as many times as you like. Tweets count until kickoff on June 1st. A winner will be randomly drawn June 2nd. Be sure to check out their website for further details and for more giveaways!